Research in the Ohno Laboratory focuses on the b-secretase enzyme called BACE1, a key player thatinitiates the production of harmful b-amyloid (Ab) and C99 fragments from their parent molecule APP in Alzheimer’s disease (AD). Although the ultimate cause of AD remains unclear, there is a growing consensus that Ab and C99 accumulate to high levels in brain and disrupts nerve cell function, leading to memory deficits. His research team has demonstrated for the first time that knocking out BACE1 gene dramatically reduces Ab/C99 concentrations and prevents AD-like memory impairments, synaptic dysfunction and cell loss in animal models, providing a proof-of-concept for therapeutic BACE1 inhibition. Meanwhile, recent findings from the Ohno laboratory suggest that successful Alzheimer’s therapies with BACE1 inhibition mayhave to be started during relatively earlier disease stages. 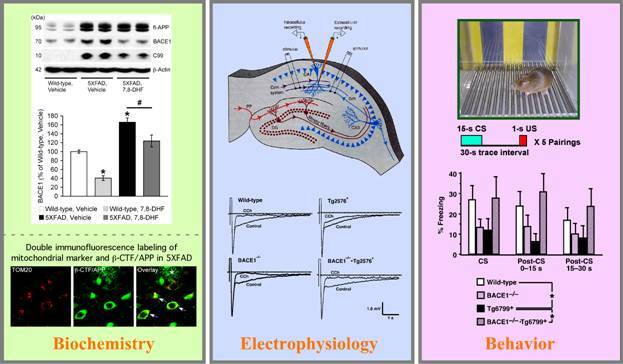 Moreover, emerging data indicate that BACE1 has a number of substrates besides APP and fulfills physiological functions. Therefore, it is important to balance tolerable side effects with sufficient Ab/C99 reductions for efficacy in BACE1 inhibition. Ohno and colleagues are exploring novel strategies that will overcome the limited benefits of therapeutic BACE1 inhibition while obviate potential adverse effects associated with direct over-inhibition of this enzyme. To achieve these goals, the laboratory works in mouse models of AD, and uses a combination of molecular biology, biochemistry, pharmacology, electrophysiology, and behavioral assays. The results are expected to have important implications for the development of truly disease-modifying strategies that can slow down or halt the deterioration of brain cells in AD and improve memory deficits. We found that treatments with a small-molecule TrkB agonist can reverse AD-like phenotypes including memory deficits in 5XFAD model mice, representing a feasible therapeutic approach that boosts deficient neurotrophic signaling in AD (Neuropsychopharmacology 37, 434-444, 2012). Our investigation with genetic mouse models reveals the critical mechanisms by which the therapeutic benefits of b-secretase inhibition may decline during the progression of AD (Translational Psychiatry 3, e284, 2013). Our mouse model study shows that PERK, an ER stress-associated kinase that is overactivated in AD, is a critical therapeutic target to alleviate multiple detrimental events such as accelerated Ab production, CREB dysfunction and neurodegeneration (Neurobiology of Aging 35, 2272-2281, 2014). We provide insights about the mechanisms by which b-amyloidosis and related cognitive deficits become less responsive to rescue by BACE1 inhibitor drugs during the course of AD development (Current Alzheimer Research 12, 13-21, 2015). We report that deficiency of the BDNF receptor TrkB, an event observed in MCI or incipient AD brains, exacerbates AD-like signaling aberrations and memory deficits without affecting b-amyloidosis in 5XFAD mice (Translational Psychiatry 5, e562, 2015).